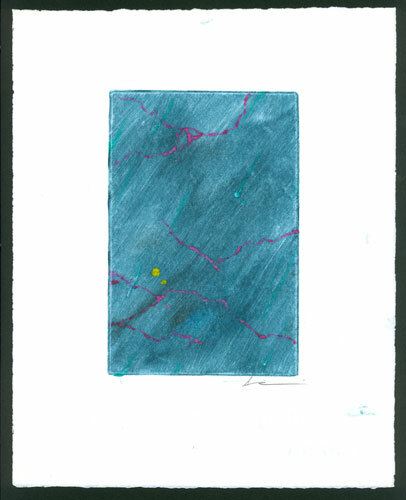 The origin of this monoprint’s title is a bit odd — it’s not really named because of the magenta “veins” in the blue marble, but because the 3 pure inks used here (blue, yellow and magenta) are the colors you need to mix to get a really good, realistic blood red. I suppose it says a lot about me that I spent a lot of time figuring out how to mix the perfect shade of blood, but everyone needs a hobby, right? Painted to resemble natural stone with inclusions of magenta veins and a few small flecks of yellow “gold,” this piece has always had a rather soothing quality to me despite the morbid name. Like my other one-of-a-kind prints, this is just a sheet of thick paper, so it’d need to be framed or matted in order to be displayed, but I’m always happy to do that for you for the cost of materials. Blood From a Stone, 4″x6″ monoprint on 8″x10″ watercolor paper, $299 with free shipping.